PRAXIS - God Revolution: Tasty Communion? I love tasty foods. Who doesn't? If I have the choice between tasty foods and non-tasty foods, that's not a choice - that's a no-brainer. I'm going with the tasty morsels every time. And I have the waistline to prove that. I'm working on finding healthier choices that are also tasty, but anyone who says healthier choices are just as good as the real stuff hasn't really tasted the good stuff! I've been in some worship settings where they provided Gluten/dairy/flour free breads for those with food allergies, and I have to confess, I've never had gluten/dairy/flour free bread that can hold a candle to what we've been getting at the Little Church on the Prairie. We've been using King's Hawaiian Bread for communion. I can't even get it at home because my wife won't buy it. But is that what the holy sacrament of communion is about? Tasty bread? LCOP will be making a change in communion bread so that those who have food allergies and are a part of LCOP can partake in the holy sacrament of communion. You see, we've had brothers and sisters who have been members here who have not been able to take communion because of their food allergies. Some have asked "Why don't we provide a separate loaf for those with food allergies?" The reason why the pastoral staff is asking the entire church to adjust to a gluten/flour/dairy free bread is because communion is about our unity in the body and the blood of Jesus Christ. The Apostle Paul writes, "Is not the cup of thanksgiving for which we give thanks a participation in the blood of Christ? 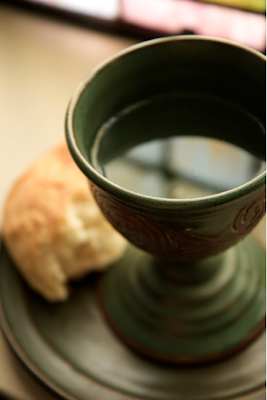 And is not the bread that we break a participation in the body of Christ? Because there is one loaf, we, who are many, are one body, for we all partake of the one loaf" (1 Corinthians 10:16-17). The sacrament of communion visibly demonstrates our unity in Christ. So here's what we promise. The worship committee and the deacons will do everything they can to get the tastiest gluten/dairy/flour free bread we can find. We will all partake of the same loaf to demonstrate our unity in Christ. We will remember to make communion not about the taste of the bread but about participating the unity offered in the blood and body of Christ. Let us celebrate our unity in Christ!